Mitra Saeidikia is an Iranian science and technology journalist working for the Mehr News Agency. 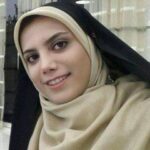 The Science and Technology Department of the Iranian president's office has recognized her as an active journalist in the field of nanotechnology. A group of researchers have used seaweed to produce biopolymer wound healers which can heal lesions, diabetic wounds, cuts and ulcers of superficial skin trauma.